If you’re a fan of using ‘kaomoji’ faces like ¯\_(ツ)_/¯ in your IM conversations, you know they’re not easy to type out. 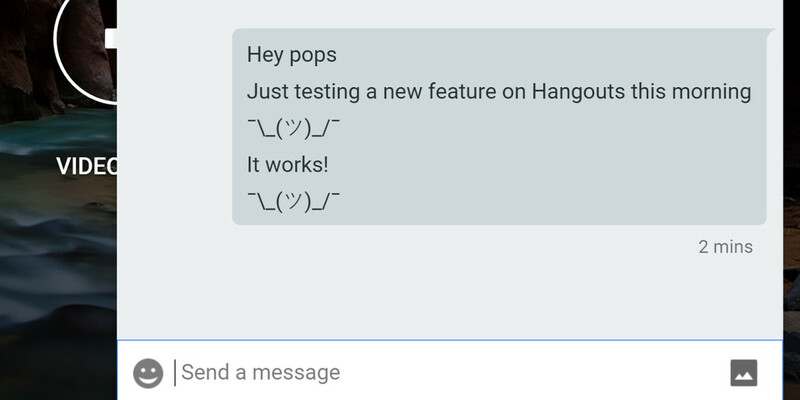 Lucky for you, Google test engineer Sage LaTorra has added a shortcut to Hangouts’ Web app to let you add a smugshrug to your message with a simple text shortcut: /shruggie. The easter egg only works on Hangouts for the Web, but you can follow this guide to learn how to add the kaomoji to your mobile keyboard dictionary for easy reuse. If you’d like to learn more about kaomoji and how to use them, check out our own Owen Williams’ story on all things ¯\_(ツ)_/¯ .